Brrr, it’s cold outside! Perfect weather for a murder mystery, don’t you think? Grab your fuzziest blanket, get cozy in your favorite pajamas and dive into today’s Book Blitz Month feature: The Mystery of the One-Armed Man by Liz Dodwell! A murder mystery and lost treasure have shipwreck treasure hunter, Captain Rex Finsmer on the case with his sidekick, Phillida Jane Trent. It’s a stormy night in Sarasota, Florida but Finn (Captain Finsmer) and his protégé, Phill are securely docked in their boat, Time Voyager. So when something causes Time Voyager to shudder and sway they know it’s not the weather. Their gruesome discovery is just the beginning of a murder mystery that revolves around the Lost Treasure of Lima, a fabulous cache of gold, jewels and artifacts stolen from the Cathedral of Lima in 1820. Will the Captain be able to solve the murder before anyone else gets hurt? Are he and Phill able to recover the treasure? And just what is the significance of the one-armed man? 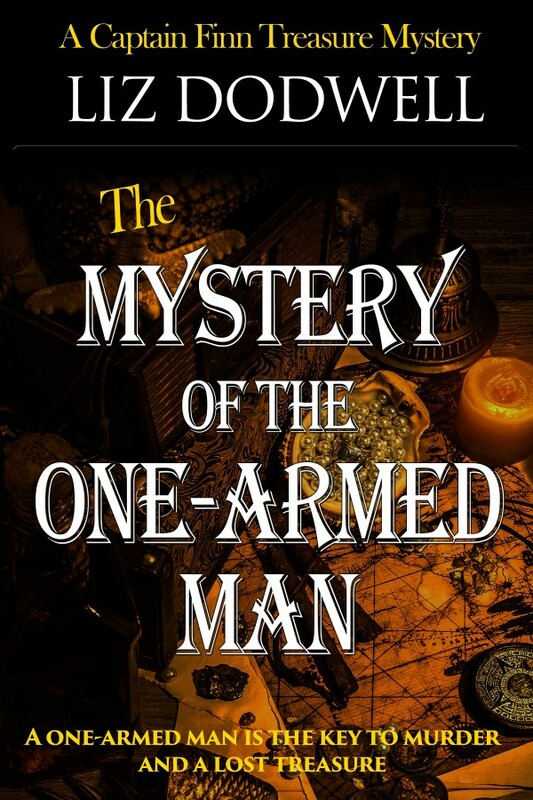 The Mystery of the One-Armed Man is a short story – about 15,000 words – and the first in the Captain Finn Treasure Mystery Stories. Prefer to read it in paperback? Grab it from Amazon (affiliate link) for $4.38! I felt it more than I heard anything. Just a slight rocking of the boat and a faint thudding, not rhythmic but spastic almost. We were at a private dock at the home of one of our sponsors on Sarasota Bay in Florida. The location gave us easy access through Big Sarasota Pass out to the “Slaver” site in the Gulf of Mexico. And it was free; a huge bonus for cash-strapped treasure hunters like us. Anyway, back to the noise. Usually I can sleep through anything. Years in the foster care system with a bunch of rowdy kids, a summer sleeping rough on the streets of Philadelphia, and then a stint in the army, pretty much disciplines you to block out noise when sleep calls. This night, though, I was having flashbacks. Not severe, but I figured it was better to keep myself awake, so I was doing something I almost never do – giving myself a manicure. I’m not a girly girl. Given my background I don’t think I ever learnt how to be, but sometimes I try. I’d picked out a color called Knockout Pout, and as I was applying the first coat Time Voyager shifted and I ended up with Knockout Pout everywhere but on my nails. Heavy weather was kicking up in the Gulf but it hadn’t affected our sheltered berth, so I figured something might have hit us. Just then I heard Finn come out of his cabin so I gave up on my beauty endeavors and opened my door. “You felt it, too,” he said. I nodded and we headed up through the galley onto the aft deck. There was a quarter moon trying to smile through a cloud-covered sky. Stepping to the bulwarks we peered down into the water. It was black, though something was moving with enough frenzy to cast a few droplets of water over us. By the time I got back with a rechargeable spotlight, Finn was waiting with a gaff in hand. I turned on the powerful halogen lamp and pointed it down. Damn it. Finn is always so reasonable. Still, I wasn’t going to stick my bare hands down there so I found a pair of heavy duty gloves and, as Finn began to raise the body up I managed to loop some line under the knees, and together we hauled the gruesome corpse onto the deck. Bile stung in the back of my throat. I swallowed it down. The man, far from young, was naked except for a pair of boxer shorts that clung to chicken-thin legs. There was no aquatic detritus evident on the body and, though I’m certainly no expert, I was pretty certain he’d not been long in the water. “Well, you were wrong about the shark.” The man’s right arm had been devoured all the way up to the shoulder. This time when the bile stung I hung over the gunwale and tossed last night’s chicken chimichangas into the bay. I’m addicted to mysteries and I love to laugh, so my books reflect that. For inspiration I look to real-life characters and events and you’ll see that in the Captain Finn Treasure Mystery series. Finn was based on my good buddy and real-life treasure hunter, Captain Carl Fismer, and the treasure trove in book one reputedly does exist but has yet to be found. Another thing you’ll find in everything I write is a mention of rescued pets. Finn has a stray cat named Shrimp that he took in. My Polly Parrett pet-sitter books feature my own three dogs and six cats – all rescued. And the romantic suspense series I’ve recently begun has its share of abused – and then saved – pets. So now you’re thinking, “What? She writes in different genres?” Well, yes. I know you’re not supposed to do that, but I write from the heart and I can’t help what speaks to me.